Sophomore Anirudh Suri has been selected as one of only 20 undergraduates from the United States and Canada to be honored as a Goldman Sachs Global Leader. Anirudh joins 100 new Global Leaders worldwide being honored for academic excellence and leadership achievements by The Goldman Sachs Foundation and its partner organization, the Institute of International Education. A resident of New Delhi, India, Anirudh is a double major in economics and political science (international relations focus) with a peace and conflict studies concentration. An aspiring Foreign Service Officer for his home country, he is a recipient of the prestigious Singapore Airlines Youth Scholarship, as well as the Starr Foundation and Pannini scholarships. He has held a variety of leadership positions in high school as well as college, the most prominent of them being the captain of Haverford's debate and cricket teams, founder-president of the International Students' Association, and co-chair of the Faculty-Student Working Group on Planning of Conferences. He also serves on various committees, including the steering committee for the Center for Peace and Global Citizenship and the advisory committee for the Pendle Hill Peace Forum. 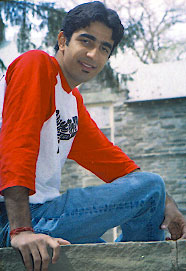 Fluent in English, Hindi, Punjabi, and Urdu, Anirudh spent the summer of his freshman year in Kashmir, in an effort to understand key aspects of the long-standing dispute between India and Pakistan. He was the only undergraduate among South Asia experts at the Conference on South Asia at the University of Wisconsin in October 2003, where he presented an academic paper, and he is now organizing a unique student-initiated conference on comparative study of conflict. Each Global Leader receives a $3,000 grant for educational expenses. Fifty Global Leaders, including 10 from U.S. and Canadian universities, will be selected to participate in the annual Goldman Sachs Global Leadership Institute July 11-15 in New York City. At the Institute they will spend time with renowned leaders from the private, public, and nonprofit sectors, learning about leadership and global issues. Past Institute speakers have included experts in leadership from Goldman Sachs and The Leadership Center at Morehouse College, and the Leader to Leader Institute, diplomats from the United Nations, executives from Goldman Sachs and other companies, and other leaders from all sectors. Since the program's creation in 2001, 400 students from more than 40 countries have been identified and honored as Goldman Sachs Global Leaders. They have built an extensive network with each other and, with modest seed funding from the program's Social Entrepreneurship Fund, have joined forces to launch innovative social ventures, including a school in rural India, a water-purification system in Bangladesh, scholarships for children orphaned by AIDS in Thailand, a micro-enterprise initiative for women entrepreneurs in Macedonia, a Malaria prevention campaign in Nigeria, a recycling program in Albania, and a meals program for schoolchildren in Sri Lanka.